Former astronaut Franklin Chang-Díaz leads Ad Astra Rocket Co. and highly charged work on the Variable Specific Impulse Magnetoplasma Rocket (VASIMR) engine. Scientists are making progress on an advanced space propulsion system aimed at a variety of uses, including reboosting space stations, cleaning up space junk and powering superfast journeys that could reach Mars in less than two months. Led by former NASA astronaut Franklin Chang-Díaz, Ad Astra Rocket Co. is developing the versatile, high-tech engine, which is known as the Variable Specific Impulse Magnetoplasma Rocket, or VASIMR for short. Ad Astra's Texas headquarters and the company's subsidiary research lab in Costa Rica are full of researchers who are attracted by game-changing, disruptive technology, Chang-Díaz said. "So, we tend to have a very young team, and they get younger and younger," said Chang-Díaz. "I guess that's because I'm getting older. But it reminds me of the way NASA used to be — so I try to look at that as a good sign." Near-Earth asteroid deflection mission based on Ad Astra’s Viento solar electric propulsion spacecraft equipped with VF-200-class VASIMR engines. VASIMR heats plasma — an electrically charged gas — to extreme temperatures using radio waves. Strong magnetic fields then funnel this plasma out the back of the engine, creating thrust. The most advanced VASIMR engine is Ad Astra's 200-kilowatt VX-200. The pathway to the VX-200 was discussed at the 33rd International Electric Propulsion Conference, held at The George Washington University in Washington, D.C., last month. Company officials gave details about a plan to flight-validate another VASIMR variant, the VF-200, on the International Space Station (ISS) in the next few years. Key to this upcoming flight test is an electric-propulsion package called Aurora, which Ad Astra is also developing. Aurora, which carries a VASIMR VF-200 high-powered plasma source, is a commercial test bed that will operate as part of the ISS. VASIMR engine could reboost the ISS, and other stations, such as the Bigelow private facility. With the Aurora trial looming, is it now showtime for VASIMR? "It is, absolutely — we see that test on ISS as a gateway," Chang-Díaz told SPACE.com. "That's what we're marching to … a demonstration of the VASIMR on the Aurora platform on the ISS." Extensive, multiyear ground testing of VASIMR shows no signs of wear and tear on the engine, after more than 10,000 high-powered shots, he added. A Space Act Agreement with NASA enables Ad Astra's commercial testing of advanced electric propulsion and power systems in support of developing space commerce and exploration requirements. "The agreement with NASA is that they will do the integration of the system on the ISS," Chang-Díaz said. "We've been working with the NASA ISS program on finding the right location to place the device … and we found it to be on top of the [station's] Z-1 truss." The Aurora would be delivered to the ISS by a commercial launcher and robotic transfer vehicle, such as Orbital Sciences' Cygnus vehicle or other commercial delivery spacecraft. Prospective placement of Ad Astra’s Aurora platform on the International Space Station's Z-1 truss. Chang-Díaz said that getting onboard the ISS can happen about three years from now. But doing so will require an infusion of cash — roughly $100 million to prepare the ready-for-flight hardware. And Aurora would have broader applications as well, becoming a National Plasma Physics Laboratory suitable for performing a variety of studies in space. "We believe this platform can do a lot more than just test the VASIMR," Chang-Díaz said. "It can be used for exploration technology development and demonstration. 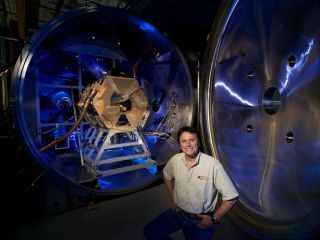 We also feel we can offer this platform to other electric thrusters that also want to test in space." VASIMR engine-enabled deflection of potentially dangerous asteroids, as well as capture and repositioning of space rocks for mining and resource recovery. Helping to declutter the cosmos of human-made leftovers is a possible use of VASIMR technology. Chang-Díaz is a record-holding veteran of seven space shuttle flights and three spacewalks carried out between 1986 and 2002. "For me, going to Mars was, of course, a dream — a dream of every astronaut," Chang-Díaz said. However, his trips into Earth orbit have somewhat modified and tempered his approach to space. "I was not quite as aware of the limitations of speed that we actually have in space to get to Mars," he said. "I became very aware that sitting in a spacecraft for a year going to Mars was not going to be pretty. Space is very inhospitable. When you don't have electricity, it gets cold. You are in the middle of nowhere. When you're on your way to Mars, it's like you are flying on a cannon ball. You have no choice but to go there, even if you don't have the oxygen to get there." Taking that long-haul approach to planting feet on Mars is a nonstarter, Chang-Díaz said. "I think we need to give the astronauts a fighting chance. That's why I believe we ought to do the technology development before we keep talking about Mars." Using a VASIMR engine to make a superfast Mars run would require incorporating a nuclear reactor that cranks out megawatts of power, Chang-Díaz said, adding that developing this type of powerful reactor should be high on the nation's to-do list. As for advancing technologies, Chang-Díaz said to keep an eye on superconductivity work. "Superconductivity is something that has enabled us to build the magnet that we now have," he said. "But the field is rapidly developing into more powerful magnets and lighter-weight magnets, so I think some day, the magnetic fields that we will be able to use are going to be much higher than the ones that we are using now — and that will enable us to go to much higher temperatures and densities on the plasma." That raises the futuristic specter of nuclear-fusion rockets, which could open up the entire solar system to exploration, Chang-Díaz said. Although these possiblities are exciting, "we don't want to get too far ahead of ourselves," he cautioned. "Otherwise, people begin to put us into the science-fiction category, and we don't want to be there. We want to be here and now." Leonard David has been reporting on the space industry for more than five decades. He is former director of research for the National Commission on Space and is co-author of Buzz Aldrin's new book, "Mission to Mars – My Vision for Space Exploration," published by National Geographic.Follow us @Spacedotcom, Facebook or Google+. Originally published on SPACE.com.